Charles Edgar Hamlin was born on 22 March 1872 at Georgia, United States. He married Mattie Shiver. Charles Edgar Hamlin died on 12 October 1954 at Lafayette, Florida, United States, at age 82. He was buried at Airline Cemetery, Lafayette, Florida, United States. Mattie Shiver was born on 12 May 1882 at Georgia, United States. She married Charles Edgar Hamlin. Mattie Shiver died on 4 April 1956 at Lafayette, Florida, United States, at age 73. She was buried at Airline Cemetery, Lafayette, Florida, United States. Benedictus Townsend was born say 1710.1 He married Lucilla Light, daughter of William Light, circa 1735 at "Millfield", Broadkill Creek, Sussex, Delaware, British Colonial America.2 Benedictus Townsend died before 1769 at Hilson Bay, Craven, South Carolina, British Colonial America. Benedictus Townsend and his wife, Lucilla Light probably lived their early married life on the 200-acre estate called “Millfield” in Delaware. The earliest record we are aware of concerning Benedictus Townsend is a Sussex County, Delaware Deed dated 4 August 1736 wherein Benedictus Townsend and Lucilla, his wife, and Mary Light all of Sussex County deed a 300 acre plantation “situated… on the East and West side of a Branch called The Beaver dam branch...” to John Light.2 William Light, who died intestate, and was the father of Lucilla, Mary and John Light had owned this plantation. The land was transferred “for divers good causes and consideration of the full and just sum of three pounds lawfull money of America”. This deed likely was to provide John Light clear title to his father’s land, which he likely had title to under the right of primogeniture. This record places Benedictus in Sussex County in 1736. 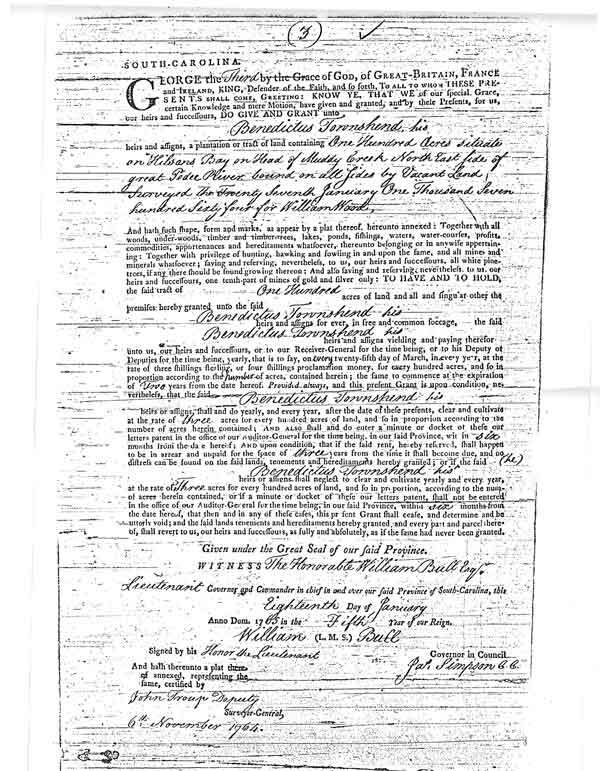 Another Sussex County deed dated 10 December 1745 shows Mary Light, Betty Light and Benedictus Townsend buying for 4 pounds current money the 200 acre plantation called “Millfield” located on the south side of Broad Kill Creek from the descendants of William Clark.3 As indicated in this deed, William Clark on 10 October 1696 “did convent to survey and make over” the plantation called “Millfield” to John Light, the elder. Although it is not clearly stated in the deed, it would appear that this 1745 deed was to finally “make over”, after 49 years, "Millfield" to the heirs of John Light, the elder. The deed clearly cites this land passing from John Light, the elder to his son, William Light and then to William’s issue, Elizabeth Light, John Light, the younger, and Lucilla Light. John Light, the elder, William Light and recently John Light, the younger, had all died intestate, thus likely causing confusion as to the ownership of this estate, thereby causing this deed to be prepared. Mary Light and Betty Light are the children of John Light, the younger. Benedictus Townsend represents his wife, Lucilla. 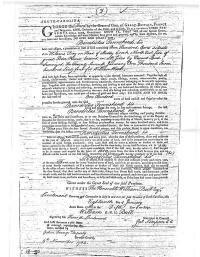 The next record is a Sussex County Delaware deed of sale dated 3 May 1750 wherein Benedictus Townsend and Lucilla, his wife, sell 200 acres of land call “Millfield” to Adomozah Little for 30 pounds money.4 For Benedictus and Lucilla to sell this land they would have had to have clear title. We infer from these three deeds that John Light by 1736 was probably living at his 300-acre plantation on Beaver Dam Creek and that Benedictus and Lucilla Townsend were living on their 200 acre plantation called “Millfield”. As the Light’s had owned and likely lived at “Millfield” since 1696, it is very probable that Lucilla was born there and also married Benedictus there. From the property description in the deeds, the “Millfield” plantation encompassed the Gitto Branch on the south side of Broadkill Creek in Sussex County Delaware. Broadkill Creek is now called the Broadkill River. We were not able to determine the location of Gitto Branch. However, the location of “Millfield” is likely within a mile or two south of where present day Delaware Highway 1 crosses the Broadkill River as this is the same location where present day Beaverdam Creek flows into the Broadkill. John Light’s 300-acre plantation was on Beaverdam Branch and likely located near “Millfield”. Probably all of Benedictus and Lucilla’s children were born at “Millfield”. We also know that Benedictus may have been literate as he signed his name with his signature rather than “his mark”. He must have taken great pride in his name as he consistently used Benedictus in all the records we have found on him. The rarity and his consistent use of the name Benedictus assured us that records containing that name were of him and not another Townsend. In later generations the name Benjamin frequently occurs no doubt in place of Benedictus. Benedictus removed from Delaware to North Carolina in 1750, based on the date of the sale of his “Millfield” land and his appearance as “Benodictos Townson” on "A List of Tythables on Dan River for the Year 1751”5 in Granville County, North Carolina. The Granville County North Carolina tax list for the previous year, 1750, is entitled "A list of Thythables on Dan River from ye Countrey Line Creek & upwards".5 The 1750 list has many of the same names appearing on it as appear on the 1751 list. For example, Abraham Whitworth paid 2 tithes for himself and for Isaac Whitworth on both the 1750 list as well as on the 1751 list. Abraham and Isaac Whitworth are listed just above Benedictus Townsend on the 1751 list. Thus the two lists clearly cover the same geographic area for succeeding years. Both lists have “Dan River” in their titles, however, the 1750 list contains “from ye Countrey Line Creek and upwards” whereas the 1751 list does not contain that statement. This area encompasses the northern half of present day Caswell County, North Carolina above Country Line Creek. Country Line Creek flows from the southwestern edge of Caswell County northeast to the northern edge of the county where it flows into the Dan River near the North Carolina/Virginia border near present day Milton, North Carolina. Thus this area borders present-day Pittsylvania County Virginia just south of Danville, Virginia. The 1751 Tax list discussed above also indicates that there were no male children over the age of 16 living in Benedictus’s household in 1751. Tithes were required to be paid on all males age 16 and older at that time and it is unlikely that the tax collector would have missed anyone that owed a tax. From this record we infer that all the male children of Benedictus were born sometime after 1735. That portion of Granville County 'from ye Country Line Creek and upwards" became part of Orange County when Orange was formed in 1752, and then became part of Caswell County when that county was formed from Orange in 1777. We were unable to locate any other tax, land or marriage records concerning Benedictus Townsend in Granville or Orange County except for the 1751 tithable tax record. We thus were unable to document where he resided during the period from 1751 to his appearance in South Carolina in 1764. However, we believe that he and his family were residents of Orange County during that time. On 18 January 1765, Benedictus was granted land described as " One Hundred acres situate on Hilson Bay on Head of Muddy Creek North East side of great Pedee River. bound on all sides by Vacant Land. Surveyed the Twenty Seventh January One Thousand Seven hundred Sixty four for William Wood" Plat certified 6 Nov 1764.8 On 16 July 1765 he was granted additional land described as "Fifty acres in Craven County on the NE side of Pedee River bounded on all four sides by Vacant Land".9 These were Crown grants from King George III signed by William Bull Lieutenant Governor and Commander in Chief of The Province of South Carolina. The rent to be paid "every 25th day of March in every year at the rate of three shillings sterling or four shillings proclamation money for every hundred acres ... the same to commence at the expiration of two years from the date hereof." Benedictus, and his heirs were further obligated to "do yearly, and every year, after the date of these presents, clear and cultivate at the rate of three acres for every hundred acres of land". These Crown Grants were offered as "headrights" to encourage settlers to come into the wilderness, clear and live on the land. The headright practice beginning in 1755 was to allow 100 acres for the head of the household and 50 acres for each additional person in the household be they male, female, free, or slave, white, or black. Thus his grant of 100 acres of land was for Benedictus, alone, which implies that his wife, Lucilla, may have died before 1764. Her death may also have been a reason for his leaving North Carolina. The second grant for 50 acres implies one other person was with him or possibly decided to join him shortly after he moved to SC based on the dates of the petitions. The quit rent scrolls show “William Benedictus & William Townsend” listed as having paid the rent due the Crown in 1768 on 50 acres of land. “Light Townsend” is listed on the next entry as having paid the rent due on 100 acres of land. A notation to the “William Benedictus & William Townsend” entry shows “New Grant July 16, 1765. In those names.” A notation to the Light Townsend entry reads “New Grant Jan 18, 1765”10 These notations show that new grants had been made on the 50 acre and 100 acre properties that Benedictus Townsend had been granted in 1765. The following year, 1769, a William Townsend paid the quit rent11 on the 50 acres of land. There was no mention of a William Benedictus or Benedictus. Also at that same time, Light Townsend paid the quit rent on the 100 acres of land. William Townsend and Light Townsend were also found to have paid quit rents on 50 acres and 100 acres respectively in 177011 and in 177312. These entries for Quit Rent payments and “new” grants show that William and Light acquired Benedictus’s land before 1768, by purchase, gift or inheritance. William Benedictus Townsend is very likely Benedictus Townsend. The above suggests that Benedictus Townsend who does not appear on the quit rent scrolls, either removed from South Carolina or died there before 1769 as no further records on him have been found. As his sons remained for several years in South Carolina this implies that he likely died there before 1769. That is the basis we have used for his date and place of death. However, another possibility is that Benedictus moved back to Orange County, North Carolina after establishing his sons, William and Light on their own land in South Carolina. It could be that William and Light were not old enough to petition and own land in their own right, so Benedictus petitioned for it in his name and then transferred it to them when they came of age. As will be shown in the biography of Thomas Townsend (1735-1796), Thomas and probably others remained in North Carolina until well after the Revolutionary War. It could be that Benedictus also returned to North Carolina about 1768 and possibly died there at a date later than 1769. [S974] Joseph T. and Clarice T. Burval, Benedictus Townsend of South Carolina,. [S362] "Sussex County Delaware Deeds". Deed Book G, No. 7 (1732-1743) pp. 165-166. [S362] "Sussex County Delaware Deeds". Deed Book H, No. 8, pp. 99-100. [S362] "Sussex County Delaware Deeds". Deed Book H, No. 8, pp. 260-261. [S363] "Granville County, NC Tax Lists". [S779] Brent H. Holcomb, SC Land Petitions 1757-1768, p.197. [S779] Brent H. Holcomb, SC Land Petitions 1757-1768, p.203. [S720] "Benedictus Townsend 100 Acre Grant". [S721] "Benedictus Townsend 50 Acre Grant". [S781] "SC Colonial Quit Rent Rolls". 1767 Quit Rents, part 2 pp. 248B & 249A. [S781] "SC Colonial Quit Rent Rolls". 1768/69 Quit Rents, pp. 332B & 333A. [S802] Theresa M. Hicks and Frances S. Osburn, SC Quit Rents 1772-1774, p. 193. William Townsend was born circa 1746 at "Millfield", Broadkill Creek, Sussex, Delaware, British Colonial America. He was the son of Benedictus Townsend and Lucilla Light. William Townsend (1746- ) is first found on the 1768 quit rent payments made by “William Benedictus & William Townsend” on the 50 acres of land that Benedictus Townsend had been granted on 16 July 1765. In that year they had a "new grant" made in their names.1 The following year, 1769, William Townsend (1746- ) paid the quit rent on the 50 acres of land and there is no mention of a William Benedictus or Benedictus. Again in 1774, William Townsend (1746- ) is listed as paying quit rent in the amount of 4 shillings proclamation money per acre on 50 acres for the year 1772 & 1773.2 These entries for Quit Rent payments and new grants made in these names suggest that Benedictus may have died before 1769 and his son, William, inherited or purchased the 50-acre tract. These are the only records found referring to William Townsend (1746- ), son of Benedictus Townsend. It is very likely that William Townsend (1746- ) was still living in the Marlboro County area in 1786 as a deed dated 4 September 1786 between: "George Trayweak planter of Marlborough and William Townsend, son of John Townsend"3clearly distinguishes William, of this deed, as the son of John Townsend (1760-1843). This most likely was done to distinguish William, son of John from his Uncle William Townsend (1746- ) who must still be living in the area. We estimate William as being at least age 21 in 1767 and thus he was likely born before 1746. We have assigned his birth year as circa 1746 although he could have been born before that date. [S781] "SC Colonial Quit Rent Rolls". 1767 part 2 pp. 248B & 249A. [S799] "Marlboro SC Deeds". Deed Book A-1, p. 41. Cortney (--?--) married John Townsend, son of Benedictus Townsend and Lucilla Light. Edith Needham was the daughter of Charlie Needham and Wilda Belle Boatright. Charles Needham was the son of Charlie Needham and Wilda Belle Boatright. James Needham was the son of Charlie Needham and Wilda Belle Boatright.